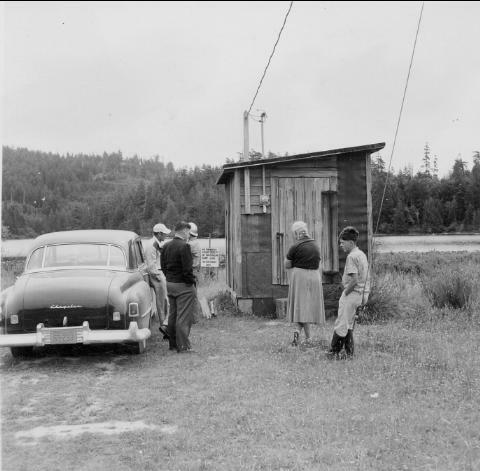 The Kemp Lake Waterworks Improvement District was established on May 26th of 1953 by Letters Patent under the Water Act of British Columbia. 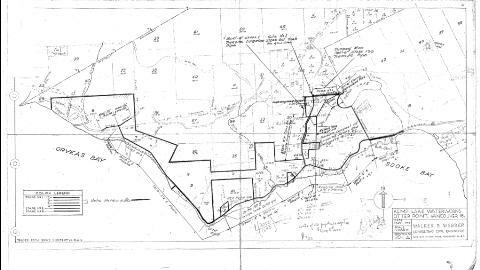 Between May of 1953 and Oct of 1956, the boundary was amended 6 times as more property owners wished to join. Since then, the boundary has increased and decreased several times as different areas joined in and others opted out. We would be please to hear from any one who has any historical information, maps and/or pictures. The shape of the pump house has not change much over the years. It was rebuilt at some later time with a slight expansion and the roof line sloping the opposite direction. 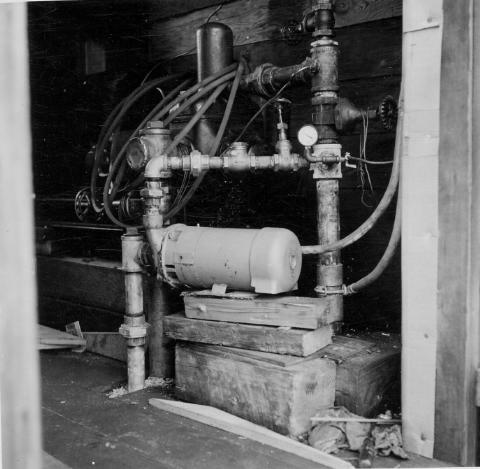 There were two pumps at this time, one in the fore ground is a Fairbanks Morse 5551D 1 horse power electric pump with a 1-1/2" suction and a 2" discharge. In background, barely discernable, is a standby 3 horse power reciprocating piston pump driven by gasoline engine. The original intake pipe appears to have been 150 feet of 6 inch corrigated galvanized pipe. Quite a bit smaller than our current pumping system. 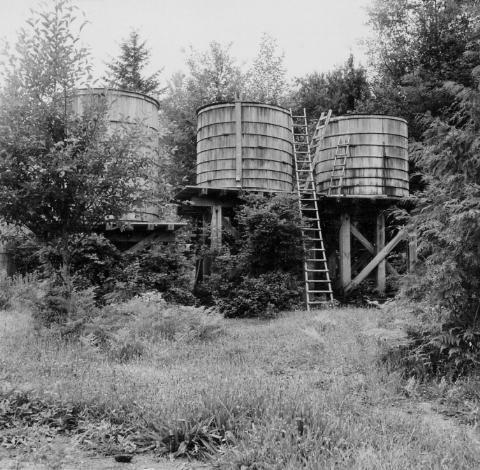 These tanks contained approximately 10,000 US gallons and were located in the approximate center of the 84 acre section lying south of Chubb Rd. 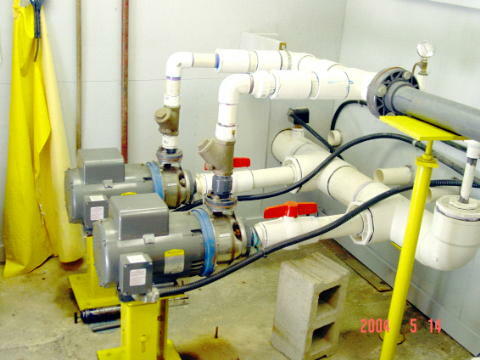 Two on the right were being used at this time, having a total capacity of about 6,000 US gallons. Only 6% of our current reservoir capacity. 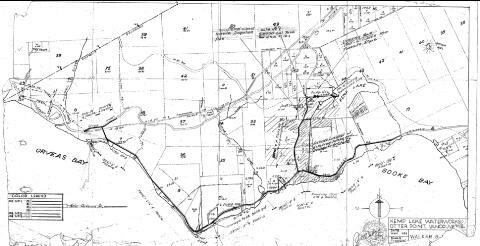 The distribution pipe was originally also wood stave and ran straight down the middle of the valley from the east end of Davidson Road to West Coast road just west of what is now Carpenter Road. 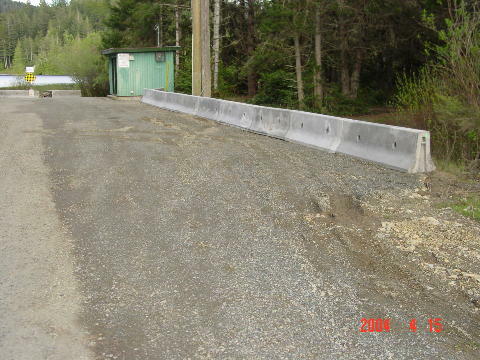 The pipe along West Coast road from Kemp Lake road east for about 1,500 feet. This map showed various stages of proposed modifications and extensions to the pipe lines servicing the district. 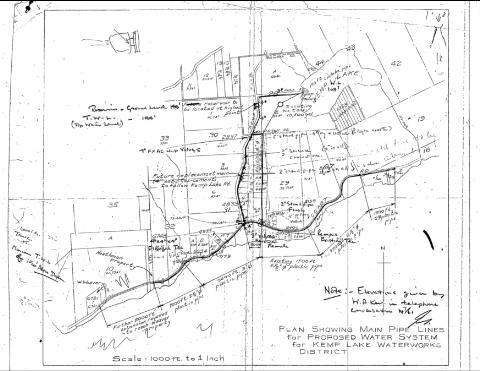 This plan indicates an intention to run water service west along West Coast road pass Gordon's Beach area to the western end of Otter Point road. This map is actually an old photocopy of the next map, but each map was used for different notes. These maps were printed in 1955 and later used to make various notes regarding piping systems in use and proposed. Now it is difficult to tell exactly the state of the system at that time. The various hatching lines show the addition of different sets of properties under a series of boundary amendments. This map shows the boundary of the district as of October, 1956. It extended all the way pass Tugwell Creek. The district also contained some holes then. For example, most of section 10 in the middle of the map, was outside of the district while a small block of three lots in the left half of section 10 are in the district.